Low bulk freight rates and less than compelling commodity prices are not ideal conditions for those supplying materials handling equipment, writes Michael King. In a bid to boost sales, many are now searching out new cargo markets or seeking to further explore geographies where they have already achieved success. This is particularly apparent in the floating crane and offshore transhipment market, where operators are also countering the reluctance of miners to commit to heavy investments by promoting the low-fixed cost and flexibility of assets that can be rapidly transferred to where they are needed most. Typical is Swire CTM Bulk Logistics, which already has a solid portfolio of offshore handling solutions in operation in Asia, mostly in the coal sector. Trevor Larbey, general manager, said the company was now marketing and adapting its coal solutions to the needs of customers in the iron ore and bauxite sector. “Since 2012 the coal market has been in decline with prices falling through oversupply and softening economic fundamentals,” said Larbey. “This, however, raises the importance of transhipping transfer rates to vessels, as faster turnaround times increase output volumes and the opportunity for mines to lower their operating costs.The longer you have a vessel loading the less volumes are selling. Terex Port Solutions, meanwhile, has been achieving yet more success in the US with its series of Terex Gottwald floating cranes. Based on mobile crane technology,TPS usually supplies the floating crane from the slew ring up and combines the machine with a barge provided by the customer. The crane can also be installed on a self-propelled barge to enable self- navigation without the need for a tug for ship-to-ship transshipment and ship-to-quay operations. Last year the company sold its 30th floating crane and, fittingly, it was due to be deployed on the Mississippi River, where TPS has enjoyed most of its US success. The Model 8 crane ordered by Associated Terminals will be deployed at the Port of South Louisiana and will be configured as a G HPK 8400 B four-rope grab variant. He said a good example of the company’s design innovation was the patented Terex® Gottwald weighing system. This unique system is installed direct on the crane and allows bulk materials to be precisely weighed during handling.“Besides simple integration into the handling process, the weighing system offers benefits to the bulk-industry by giving operators absolute transparency, up to every single grab, and objective performance measurement,” he said. Elsewhere TPS has had success marketing its floating cranes in Brazil and the Netherlands in the Ports of Rotterdam and Amsterdam, but its second biggest market is now Indonesia, a major export of bulk cargoes, especially thermal coal. “In Indonesia all cranes are dedicated cranes for open sea application working several kilometres off the shore in transhipment of coal,” said Klein. Of course, Swire CTM also made its name in Indonesia’s coal sector. There it has been one of the pioneers of offshore bulk handling solutions, and its floating platforms have been a key enabler for miners as they seek to overcome the archipelago’s shallow draughts and limited port capacity by using river and barge systems to feed offshore stations to load ocean –going vessels. Indeed, Indonesia’s rise to become the world’s leading thermal coal exporter would not have been possible without its multitude of transhipment platforms. Swire’s first major success in Indonesia came in 2008 with the Princesse Abby – jointly owned with PT Mitra Bahtera Segarasejati (MBSS) – which was deployed off Kalimantan. A second floating transfer system was then also built for PT Berau Coal and christened the FTS Princess Chloe, which Larbey claims is “arguably the fastest coal loading vessel in Indonesia” currently in operation. The 5,500 GRT Princess Chloe is 98 metres long, 27 metres wide and has a draught of 4.8 metres. Designed by Italian companies Logmarin and Interprogetti and classed by Rina, the vessel features two Liebherr electro-hydraulic cranes able to handle 28 tonnes at 27 metres and is fitted with 2 × 20.6m3 coal grabs supplied by SMAG Peiner and a continuous belted shiploader supplied by Bedeschi. The unit is also fitted with metal detection and sampling units. “Despite the current downturn occurring in the global steaming coal market, we are positive about the medium to long- term prospects for Indonesian coal both in terms of export and domestic demand,” said Larbey. “Domestic demand has doubled in recent years and the marine logistic task remains complex as regional and domestic trade volumes increase. “For Swire CTM Bulk Logistics, Indonesia is a key focus and a market in which we plan to develop future capabilities with our partners MBSS to service Indonesia's growing importance in Asia as a reliable supplier of quality maritime logistics services”. Klein, meanwhile, believes the market for floating cranes, and specifically Terex Gottwald models, is still in its infancy and offers huge potential, irrespective of bulk freight rates and commodity prices. “It goes without saying that Terex® Gottwald floating cranes can also be applied at other great rivers around the globe as well as in other ports, depending on environmental conditions,” he said. “And, in fact, there are requests from many regions. Floating cranes based on mobile harbour crane technology are quite a recent innovation and the market for these types of cranes is still growing. He also believes the formation of Terex Port Solutions gives Terex Gottwald cranes access to a much broader customer base. “When we were formerly Gottwald Port Technology, we used to be a niche market player for both mobile harbour cranes — including floating and portal cranes — and automated port equipment,” he explained. “This completely changed when we joined Terex and became Terex Port Solutions, the new force in the ports market offering the most comprehensive port- related product portfolio. “By combining our product portfolios, we are in the position to offer the individual and sustained solutions customers are really looking for — with regard to manual, semi-automated and fully automated solutions. Investment in transshipment facilities and self-unloading vessels may be an effective alternative to the shore-based terminal to stay competitive in today’s market. With Ratu Giok 5 just delivered, the fleet of floating facilities designed and commissioned by Logmarin Advisors has now reached 20 units, of different sizes and features, which have handled more than 58mt (million tonnes) of dry bulk commodities in the last 12 months. Logmarin is recognized as a world leader in the development of floating terminal solutions. On 14 February 2013, the Indonesian company PT Kartika Samudra Adijaya (KSA) held the naming ceremony for Ratu Giok 5 at Keppel Subic. This floating crane is twin sister of Ratu Giok’s ‘royal’ family, operating in Indonesia since 2011. Ratu Giok (translation: Queens of Jade), was designed by Logmarin and built under RINA supervision to meet flag regulations, IMO, MARPOL and IOPP requirements. Also for this Indonesian-flag floating crane, Logmarin carried out project management, supervision during construction and testing, assistance in procuring, crew training and will lead the commissioning at the operative site. Classed by RINA, this unit is 60 metres long, 3,400dwt and 4.15m maximum draught. Since the concept of the modern floating crane was introduced by Logmarin for the first time in Italy in 2007, nine units have been commissioned and one more is under construction. Logmarin notes that many copies of the originals are making their appearance, but the company is not overly concerned and sees it as a compliment,“...only valuables get copied” and according to the company the duplicates never perform as well as the original ones. crane positioning: perfect balancing between cargo, power and speed make this crane the most efficient one in the market, consuming only a glass of marine diesel oil for every tonne of coal handled. the Queens of Jade’s performances have been shown to be steadily above the daily contractual loading rate. The ‘older’ sister Ratu Giok 1 is the record holder, both for the best daily average loading rate (29,638 tonnes in September 2013, while loading the Kamsarmax Ocean Libra) and for the largest amount of Kaltim Prima coal loaded in a month (584,861 tonnes in last October). The Liebherr crane incorporates specific features for open water and heavy duty conditions. The cargo gathering and crane cycle time is enhanced by using a four-rope scissor lobster type Peiner 24.5m3 grab. Thanks to the great experience gained in the field and through pooling of marine knowledge, operational experience and technological skills, Logmarin can provide customized solutions: from the ‘simple’ one, like the Ratu Giok floating crane type, to the world’s largest transhipping unit ever built (Ore Fabrica). In addition to a leading position in floating terminal design, just in the past eight years Logmarin has developed 60 feasibility studies and supply chain optimization concepts for the import/export of dry bulk, gas, forest products, containers, etc, and 22 technical services (supervision, inspections, performance and maintenance monitoring, etc). The outlook for the Chinese year of the Horse, is promising too. As well as designing a multipurpose self-unloading vessel (mainly for wood chips and coal — see computer graphic on p47) and two floating terminals, Logmarin is currently involved in supply chain projects for gas (Ghana), cement (New Zealand), logs (Russia), coal (Vietnam, Indonesia and Canada,) sand (Philippines) and nickel-ore (Guatemala). Logmarin Advisors is member of RINA, a multi-national group with over 150 years of experience, 2,200 employees, 150 offices in 53 countries and €300 million turnover. RINA group companies are capable of supporting their clients providing consulting, engineering, classification and certification services, testing and inspections; every activity with custom orientation thanks to the group interaction. In particular, Logmarin collaborates closely with the civil and port engineering sister company D’Appolonia, providing broad and integrated services such as site engineering, planning and design, hydrologic and hydraulic analysis, mechanical, civil and geotechnical engineering, EIA (environmental impact assessment) and others. As with anything else in life, it is only sound, experienced foresight and preparation that guarantee success in new enterprises. Designing a supply chain and the relative infrastructures is a complex, challenging, multidisciplinary and creative process that has a critical impact on the project’s economic viability and competitiveness. However, sometimes this vital preliminary activity is driven by engineering consultancy firms, contractors or end users, with a lack of a global view and comprehensive open-minded approach to supply chain. There are many examples of supply chain solutions where end users have been ‘burned’ by improper advice. Consequences can be devastating: designed solutions proved to be completely unsuitable (some iron ore projects in Africa or Brazil), project performances and/or safety and environmental standards fall below expectations, or even leading to unforeseen expensive operations. Just to mention some significant cases: open jetty designed 300 metres longer than actually required; terminals built to comply with out-dated standards, fleet of barges unsuitable to sail at sea; floating terminals unable to handle the materials and to perform in the environment for which they were built; terminal upstream unable to cope with the downstream logistics, or vice versa, etc. bid winners are often appointed because of either their cheap proposal or their ‘big name’ worldwide. In both cases the study is usually developed by people with lack of experience and or narrow-minded approach. moreover, clients search for knowledge, expertize and capability they don’t have and that, as a consequence, they cannot easily assess and recognize the real knowledge and capability of the consultant as required by their specific project needs. Moreover, some engineering firms tend to try and persuade the client to buy the project that they want sell, rather than working together with the client to provide what they actually need. This approach is no longer successful and there are many examples in which bottlenecks, costs and opportunities are not assessed correctly and results do not meet expectations. ‘Theoretical’ and practical backgrounds have to be merged for an effective design, and this is part of the due diligence that a supply chain project requires. the team-working capability and experience synergies with its clients. a global view of the supply chain, bridging the logistic gap between supplier and industry. Preventing mistakes that may occur at the design stage is crucial for the success of the supply chain itself; this is a professional and reliable duty Logmarin guarantees to its clients, and can protect the project by mitigating risks of unplanned events. To achieve the best possible results, each supply chain needs to be considered as unique, avoiding the application of ‘standard solutions’. A solid knowledge of the market and of the material to be handled, together with technical and operational expertise, is fundamental to producing a solution delivering value to the client. Combining best practices in the design, construction and operation of conveyor-based cargo-handling systems, CSL’s self- unloading ships and transshipment vessels are breaking new ground throughout the world. In the Bay of Sept-Îles, Canada, the CSL Spirit, a 70,000dwt gravity-fed self-unloading vessel, completed the first ever loading of a Chinamax class dry bulk vessel in North America. During this historic maritime transshipment operation, 302,264 metric tonnes of iron ore were loaded by the CSL Spirit into the CSB Years, one of the largest vessels in the world, owned by China Shipping Bulk Carrier Company. Equipped with a telescopic, center-mounted discharge boom, the Panamax-sized CSL Spirit is well suited for the large-scale iron ore transshipment operation, which was performed for Cliffs Natural Resources in late 2013. The massive undertaking highlights the flexibility, reliability and efficiency that can be expected from CSL’s transshipment services, and marks a significant milestone for CSL and for shipping in North America. In Australia, the growth of global trade in iron ore and the limited availability of deep water ports have sparked a sharp increase in demand for offshore transshipment.To maximize value for customers, CSL uses technological innovation to achieve cost-effective and environmentally sustainable solutions. A case in point is the CSL Whyalla, a converted gravity-fed self- unloading transshipment vessel currently operating at Whyalla, South Australia, for Arrium Mining. 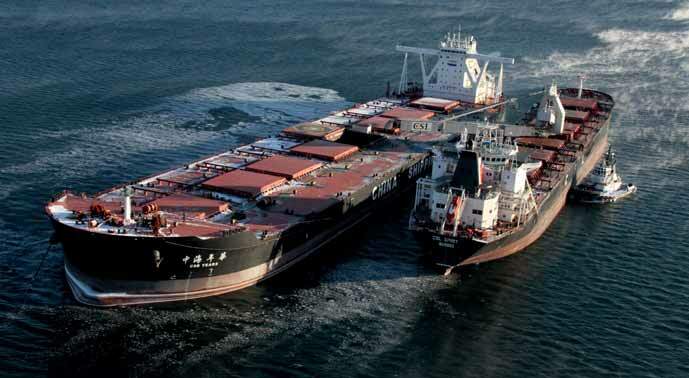 With deadweight of 12,500 tonnes, the CSL Whyalla is capable of loading on a draught of five metres and transshipping iron ore into a Capesize vessel at a rate of 4,200tph (tonnes per hour). It is highly manoeuvrable and transships the cargo via a system of inclined belts and conveyors, all of which are covered to eliminate dust. CSL Whyalla is able to operate in swells of up to two metres. CSL’s high-capacity transshippers have superior productivity and reliability built right into the design. A transshipment operation will require minimal or no dredging, reduce capital expenditures at the onset of a project, and, with simplified shore-side infrastructure, bring down maintenance costs. A fully enclosed cargo handling system eliminates the risk of fugitive material and reduces dust, noise and vibration in both air and water. Building on its capabilities and expertise, CSL has designed a high-capacity gravity-fed transshipment shuttle vessel (TSV) to cost-effectively meet the rigorous requirements of high-volume transshipment. Ranging in size from 12,000 metric tonnes to 60,000 metric tonnes, CSL’s next generation TSVs will be able to transship cargo at peak rates up to 10,000tph. The design also allows all dimensions – length, beam and draught — to be adjusted to suit the requirements of any project. Thanks to bow and stern thrusters, and dynamic positioning, the TSV can operate without tug assistance. CSL understands that customers seek a tailored, scalable, approach to their export requirements, whether they are 1mt (million tonnes) or 100mt per year. This is why the company has developed a responsive, accessible business approach to transshipping, driven by the needs of customers. A pioneer in transshipment and cargo top-off operations around the globe, the CSL Group is the world’s largest owner and operator of self-unloading vessels.